Lead poisons children. 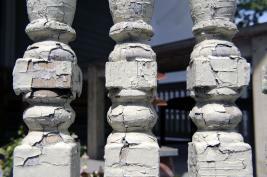 Most children get lead poisoning from lead dust and lead paint in old homes. As a property owner, you must protect children from lead poisoning. The Lead Law says owners must remove or cover lead paint hazards in homes built before 1978 if a child under 6 lives there. Lead paint hazards include loose paint and lead paint on windows or other places that children can reach. The only way to know if you have lead in your home is to have it tested by a licensed inspector. Go to www.mass.gov/dph/clppp to find a licensed lead inspector near you. If there is lead in your home, you must remove or cover it. There are different ways to do this. Call CLPPP to learn more. Who can remove or cover lead? Removing or covering is called deleading. Some work must be done by a licensed deleader. But you can do most deleading work yourself if you get trained and authorized. You may need to help tenants find a place to stay (at your expense) until the work is done. To learn more, call CLPPP and ask for a copy of the Deleading Book. There is money to help property owners pay for deleading. Encourage property owners to call the Get the Lead Out program at 617-854-1000. When you rent a home built before 1978, you must give tenants these papers before they sign a rental agreement, even if they do not have children. Any information about lead in the home. You cannot evict of refuse to rent to someone because of lead paint. This is discrimination. It is illegal. If a child is poisoned by lead, you are responsible. Complying with the Lead Law is the best protection you have from liability. If you do not comply with the law, you could face civil and criminal penalties.